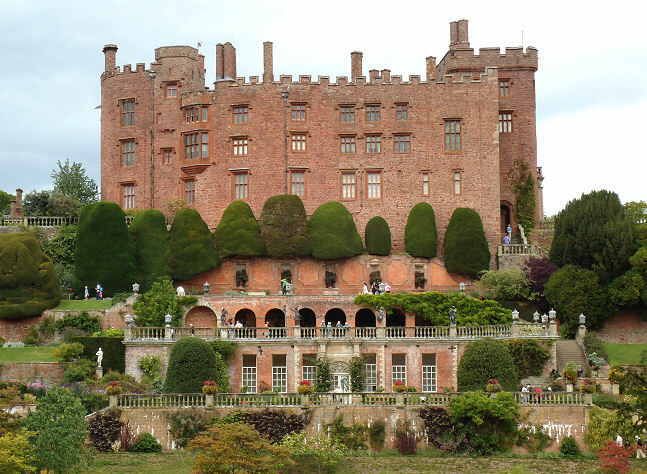 Powis Castle, Welshpool, Powys, SY21 8RF. This is one of the iconic gardens of Wales and is as good for children as it is for topiarists and plantsmen and women due to its many levels, paths and secluded areas. The Castle itself was built in the 1200’s on a commanding defensive position at the top of a hill but it later became a family home. Much of the interior of the Castle and most of the layout of the gardens dates back to the time of one remarkable woman, Henrietta Herbert (1758-1830). Henrietta wanted to make a home that was comfortable but imposing enough for visitors so that they would appreciate the status of her husband. I think she achieved this! 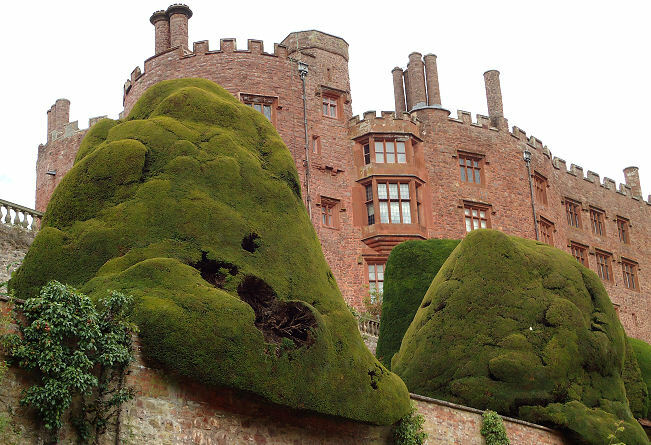 The yew trees on the top terrace were planted in the 1680’s before Henrietta’s time and they have been allowed to grow for decades then clipped and then allowed to grow for centuries so that the shapes we see today are massive and lumpy. Several of them are almost hollow inside and children and the adventurous adult can actually play hide and seek inside some of them. Considering they are grown at the end of a terrace they must have a remarkably powerful root system to hold up all of the weight. Some of the boundary hedges are also massive and it is difficult to establish where one tree begins and another one ends. Centuries of clipping gives this uneven appearance (A giant sleeping has been suggested). I do not envy the gardeners today having to clip such monsters at such precarious angles. The National Trust have provided a grass maze on the lower lawns this summer (2011) to provide a bit of fun. 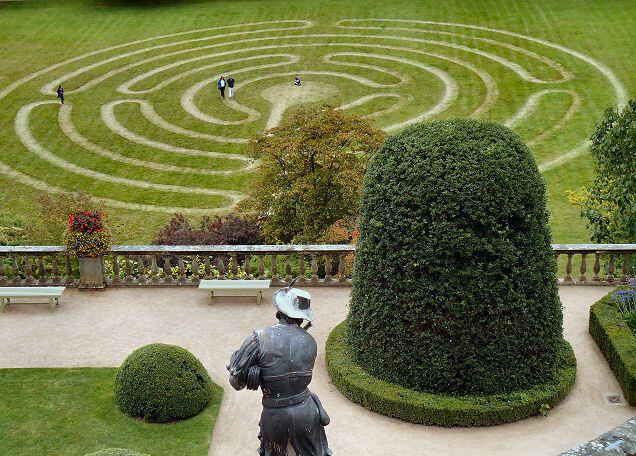 It is worth remembering that the original mazes were provided for the prayer and contemplation of religious peoples such as monks and replicated the tortuous journey of the soul seeking the Lord. 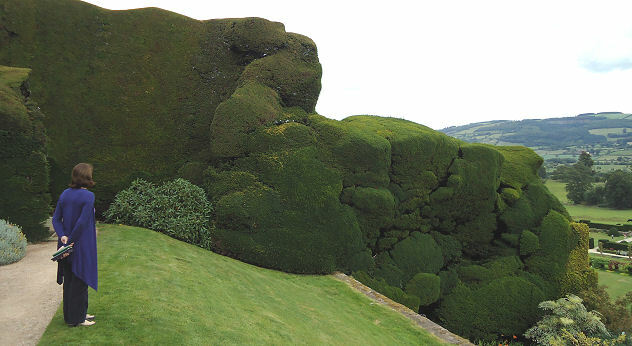 There was no need to provide hedges at this time as Monks were not supposed to cheat! The lower formal gardens have a rich mix of planting including fruit trees and grape vines and are laid out on the flat section of the gardens at the bottom of the hill. 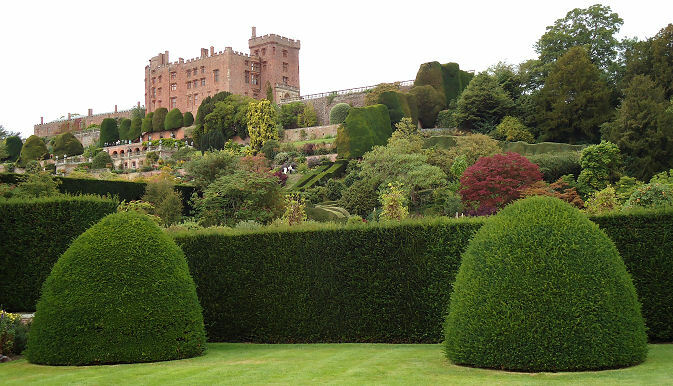 Various doors and arches in the yew hedging make the journey into each section more exciting for the visitor although originally it would have provided a source of food for the inhabitants of the castle. In the middle borders of the terraces there is a fine array of planting from all around the world and they are famed for the juxtaposition of many different plants in one section. 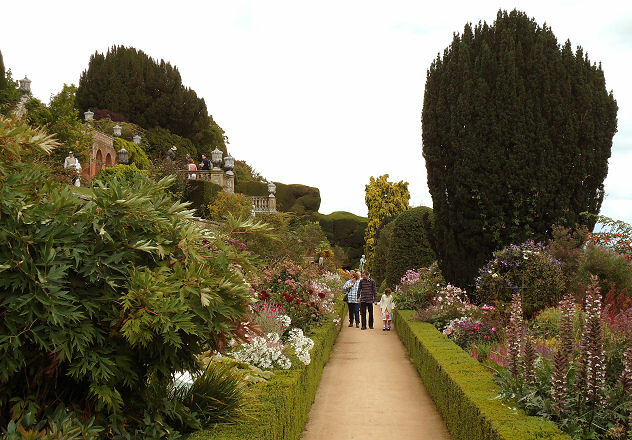 The formal gardens can be seen in total from the top of the terraces but nothing prepares you fore the scale of the “rooms” when at last you get down to them. There are also some buildings as used by the estate staff and the whole area takes on the feel of a small village. Topiary can be made of many things. The rolling Welsh countryside can be seen from the formal gardens at the base of the hill and from each of the many terraces above and sets the gardens into a marvelous context of nature in its own setting.